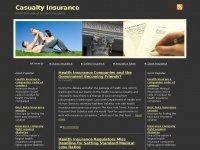 All the information about Casualty and accident insurance. Including, disability, life, hospital confinement, accidental death, and all types of people and property damage. News and related articles. 2. Health In­su­ran­ce Com­pa­nies and the Go­vernment Beco­ming Friends? /health-in­su­ran­ce-com­pa­nies-and-the-go­vernment-becom..
3. Types Of Busi­ness In­su­ran­ce Gene­ral Liabi­lity In­su­ran­ce /types-of-busi­ness-in­su­ran­ce-gene­ral-liabi­lity-insur..
4. Health In­su­ran­ce Regula­tors Miss Dead­li­ne for Set­ting Stan­dard Medi­cal Loss Ra­tios /health-in­su­ran­ce-regula­tors-miss-dead­li­ne-for-setti..
5. Secu­rity for­ces shoot an­tigo­vernment pro­testers in Ye­men /secu­rity-forces-shoot-an­tigo­vernment-pro­testers-in-..
9. Ren­tal Trai­ler In­su­ran­ce Al­ter­nati­ves Semi-trai­ler Ren­tal & Lea­sing /rental-trai­ler-in­su­ran­ce-al­ter­nati­ves-semi-trai­ler-..
A profile of Casualty-insurance.net was found on the social network Pinterest. The web server used by Casualty-insurance.net is located in Houston, USA and is run by abarecconstrucciones.cl. The server runs exclusively the website Casualty-insurance.net. A Apache server hosts the websites of Casualty-insurance.net. For managing the data of the webpages the CMS WordPress in the version 4711 is used. XHTML 1.0 Transitional is used as markup language on the webpages. To analyze the visitors, the websites uses the analysis software Google Analytics. The website prohibits search engines and webcrawlers using the description of the website from the Yahoo directory and using the description of the website from the Open Directory project. Indexing the data of the website and following hyperlinks on it is explicitly allowed by robot information. The website contains advertisements by Google Adsense.